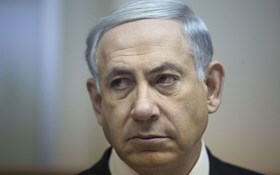 Israeli Prime Minister Binyamin Netanyahu is quite addicted to lying. However, what makes this conduct on his part especially malicious is that he lies quite knowingly, without a twinge of conscience or feeling of regret. During his visit to a small settlement in the southern Hebron hills Monday, the Israeli premier claimed that Palestinians were revolting against Israel because they wanted to kill Jews. As usual, Netanyahu completely ignored the decades-old military occupation by Israel of Palestine and the conspicuously criminal treatment meted out to millions of Palestinians whose only “guilt” is their being born non-Jewish. Netanyahu, who arrived at the settlement to show solidarity with the family of a settler woman who was killed a few days ago, allegedly by a Palestinian youngster, took advantage of the tragedy to hurl lies right and left in order to justify his intransigence and anti-peace discourse. He overlooked the fact that since the beginning of October, trigger-happy Israeli soldiers and settlers killed more than 160 Palestinians, many in an execution style and without the slightest provocation. According to eye-witness testimonies, Israeli soldiers and settlers on several occasions placed a knife or sharp object next to the Palestinian victim to give the impression that he was trying to stab Israelis. More to the point, Israeli security forces made sure that Palestinians shot were left to bleed to death. The murderous executions prompted the Foreign Minister of Sweden Krister Wickman to demand an inquiry into these crimes. Israel, which always adopts a holier-than-thou attitude toward international criticisms, rejected the Swedish call, arguing that Israel has the right to self-defense. The truth of the matter is that Israel has effectively killed any remaining prospects for a viable peace with the Palestinians by decapitating -once and for all- any remaining chances for the establishment of a viable Palestinian state, thanks to the ubiquitous metastasizing of Jewish settlements in the West Bank, especially East Jerusalem. I think all honest observers, Palestinian, Israeli and international, agree on this prognosis. Hence, it would be an expression of dishonesty or utter ignorance and naïveté to deny the obvious. This is unless what Israel, its guardian ally, the US, and the rest of the international community have in mind for the Palestinians is an insignificant state not worthy of the name, e.g. a state without Jerusalem, without demographic and territorial contiguity, without the right of return for the refugees, and without an Israeli withdrawal to the 1967 borders. Needless to say, the vast majority of Palestinians would utterly reject such a deformed entity even if the entire world sang the hymns of praise for such misshapen creature. Now Israel is facing a real dilemma, which makes Netanyahu and his ministers make nervous and totally mendacious statements almost on a daily basis. Indeed, with the two-state solution now effectively in the belly of earth, Israel has only two alternatives left: Either one state for all- from the River Jordan to the Mediterranean-or an open-ended conflict. But one state is impossible since it constitutes the antithesis of Zionism, and an open-ended conflict is a nightmarish scenario with unpredictable consequences. Facing this increasingly stark dilemma (stark because there are today in mandatory Palestine as many Palestinians as there are Jews and the Palestinian population is forecast to exceed the Jewish population in a few years), Israel is now trying to effect more ghoulish tactics in the hope that more pressure on Palestinians would force them or many of them to leave their ancestral homeland. One Israeli commentator remarked last week that if Bashar Assad could banish millions of Syrians around the world with total impunity and without incurring the wrath of the world, Israel should be able to oust some Palestinians without creating a huge international crisis. In fact, Israel is already trying this ghoulish scenario. Last week, it was reported that poverty in the West Bank and Gaza Strip has reached unprecedented levels, with many Palestinians selling their assets to remain afloat. Hence the alarming question: Would the loaf of bread be used as Israel’s ultimate weapon to force the Palestinians to leave their homeland, thus enabling Israel to succeed in liquidating the Palestinian cause once and for all?